Each hole is framed by an alpine view of rare beauty. The holes 1 through 9 wind through a pleasant pine wood with a background of the group of snow covered mountain peaks of the “Brenta“ The remaining nine holes provides a panorama of alpine villages. On the 12th hole you can view Cavareno, the 13th Sarnonico, the 14th Fondo, the 16th the impressive church bell tower of Seio di Sarnonico. In the background can be seen the Palade pass creating an elegant scenic effect. The golf course is spectacular and stimulating with wide well maintained fairways. The greens are will designed and surrounded by deep and difficult bunkers as well as mirror like water hazards. The course is technical and challenging for every level of golfer, to include the most exacting. The course covers an area of 50 hectares, which incorporates the 18-hole course, a four hole executive course, driving range, putting green, pitching green and chipping green. From the beginning of the previous century, the dynasty of the Noble House Augsburg appreciated the delicate mountains and valleys of the upper Val di Non. The number of estates of the noble family used for tourist purposes, were built on the slopes of Mount Roen, demonstrating this appreciation. Around 1920 a nine-hole golf course was built. After many years, it shows that the underlining nature and the way of live of the citizens of the upper Val di Non were able to integrate with equilibrium and respect. At the end of ‘80, the administration of Sarnonico gave back to the residents and tourists the possibility to pursue the game of golf. In 1991 from March to November, players competed on the nine holes or challenged themselves and their swing on the 4-hole executive in preparation for later memorable competition sessions. The golf course includes a putting green, pitching green, chipping green, and driving range, and a comfortable clubhouse with 7 bedrooms that were built in 2008. Golf players and friends will find these accommodations very relaxing surrounded in the south by the breathtaking beauty of “Brenta Dolomiti” and in the west by the mountain chain of the Maddalene. As the time goes by, the number of golf players is increasing and from a tourist perspective for “Val di Non” the golf course is one of the most attractive offers. In September 2003, the second nine holes were added. The nine holes were designed by the famous international architect Michel Niebdala, closely with the architect Luca Borzaga, to make a “true” golf course of 18 holes. Surrounding the golf course is an immaculate environment of spectacular alpine scenery, alpine fauna and flora, rendering an unforgettable round of golf. The new 9 holes is built on the open plain and gives a player different opportunities to express their quality of their games as well as technical precision. 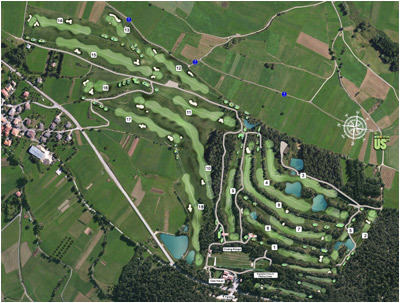 Dolomiti Golf Club is two courses in one, located in a corner of the Dolomiti to discover and to live with intensity. A highly technical course designed in harmony with nature by technical people of international fame. A splendid 9-hole course completely different from the first nine holes providing two different challenges or settings. Our eighteen-hole golf course is for renowned competition and a captivating visit to Val di Non. Come and visit us, we are waiting for you.